In The Crease: Buffalo left with another "next year"
This was the team that was supposed to change the Buffalo sports landscape forever and deliver the championship-starved city a Stanley Cup. But we were wrong. At least for now. It was essentially the same team as last year, minus a little grit (Mike Grier, Jay McKee) and scoring (J.P. Dumont), plus a year’s worth of playoff experience and a healthy defensive unit. The one thing that stayed constant was the core, the chemistry — the thing that most Sabres fans believed set this team apart from talented teams of the past. 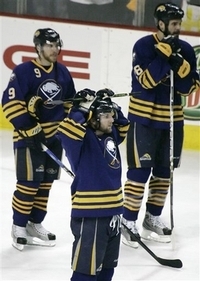 But even that wasn’t enough to get the Sabres past whatever was ailing them. From the start of the playoffs, they never completely found their groove. One period they had, the next lost it. The power play struggled mightily. One-on-one battles were lost. Desperation wavered. Yet they made it back to the conference finals to finish what they had started last season. Ottawa was ready. They remembered being eliminated by Buffalo last year. But the Sabres seemed to have forgotten what carried them to the conference finals a season ago. They relied on a Presidents’ Trophy and a quick-strike offense rather than hard work. And even when they did put forth their best effort, the passes weren’t crisp, the defensive coverage wasn’t sound, the confidence lapsed — the cerebral aspect of the game was missing. So when a few bounces didn’t go their way, the series was lost before it ever really began. Unfortunately for Sabres fans, who rallied around this team in a way even I couldn’t imagine, another long summer lies ahead. Rather than reminiscing about a team that finally brought a championship to Buffalo, they’re left wondering if management can afford to bring back a team that could win it all next year.